The Content Blockchain Project is run as an open, non-profit initiative. The Content Blockchain Network is open for anyone to create and develop new and innovative applications and tools that can connect to the distributed ledger. The initiative provides the foundational tools and the infrastructure for a new content and media ecosystem based on blockchain technology. These include chain-agnostic standards for content identification (ISCC), smart licenses and transaction models. The Content Blockchain will launch as an open source blockchain network tailored to the specific needs of the wider content and media ecosystem. It supports data streams, native tokens and on-chain governance. All project results and achievements are documented and available as open source code that can be used for any kind of commercial and non-commercial purposes. The project is also open for contributions from interested parties. Thus by design, the Content Blockchain network is open for anyone to create and develop all kinds of new and innovative applications and tools that can connect to the distributed ledger. The ISCC is a modern algorithmic content identifier for multiple media formats (text, image, audio, video). It is designed to work as a generic cross-sector standard (news journalism, book and academic publishing, music industry, etc.) that supports advanced machine learning applications. The ISCC allows publishers and creators to independently generate content identifiers from metadata and the content itself. 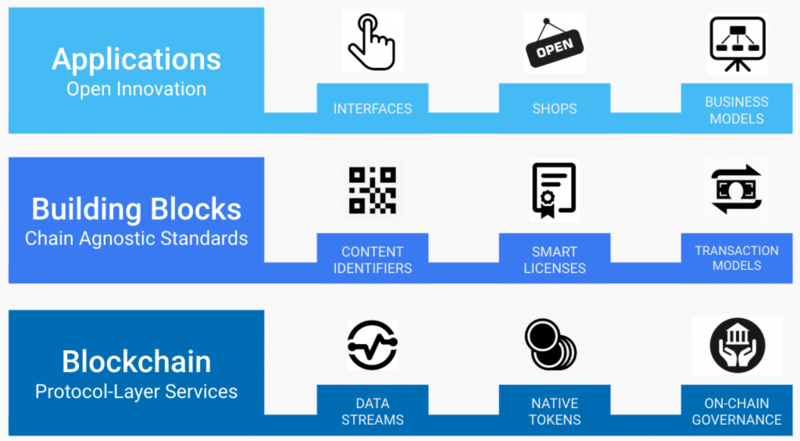 Smart Licenses are machine readable license information on the blockchain, inseparably connected to the content. Smart License Templates can serve any individual business case and will simplify license transactions and trade on the blockchain. The Content Blockchain is the first public blockchain platform with built-in governance tailored to the requirements of the content industry and built for the benefit of the media and content ecosystem. The Content Blockchain is building the foundational tools and the infrastructure for a new blockchain based content ecosystem.